Cross country racers geared up for state with conference meets this past weekend. 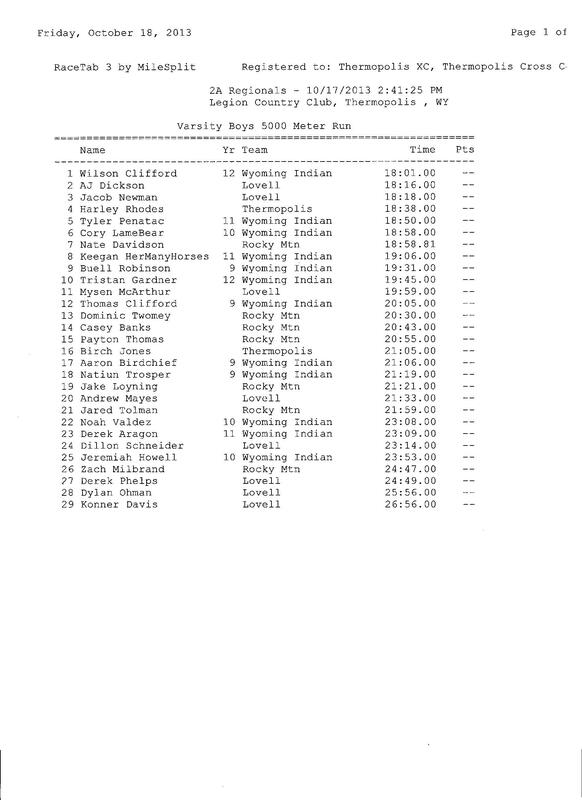 Laramie would put five runners in the top six spots, led by Jonah Henry, and run away with the team title. They scored 16 points to runner up Gillette's 62. On the lady's side, Gillette put five in the top seven spots to do the same. Tabitha Simmons of Gillette led the way placing first. Natrona's Ashley Sondag was the girl's champion while Rock Springs runner Ricky Faure was the boy's winner. Cody sophomore Brody Smith was the boy's champion while Jackson Freshman Anna Gibson won the girls race. Gibson won by over a minute while Smith's win was a mere four seconds ahead of Star Valley's Cody Peck. Teamwise, Star Valley won the boy's title while Jackson won the girl's. 1A/2A Results not yet available. Jace Walker and Cayla Adams, both from Hulett/Sundance won the individual races at Pine Haven. The Moorcroft boys and Wright girls were team champions. Wyoming Indian swept the team titles of the 2A West. Wilson Clifford of WIHS was the boy's champion while Freshman Charlene Brown of WIHS was the girls winner.